Still playing Pokemon Go? 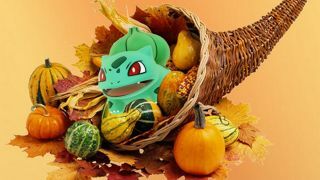 Niantic is thankful for you. And since there's no better time to express thanks than the week of Thanksgiving, the studio is holding a special event from 7pm November 22 to 7pm November 30. During this time, you'll earn double the amount of XP and Stardust you normally would. It's not quite as exciting as the Pokemon Go Halloween event where players got extra candy and certain pokemon appeared more often, but I'll still take it. Heck, if nothing else it'll give me a good excuse to walk off all the extra calories I plan to intake over the holiday weekend. If the effects stack, I definitely recommend saving up on your Lucky Eggs, since those already give double XP. Double XP + double XP is gonna mean a lot of people leveling up super fast.